Home Office approved NoGo Nut & Bolt Head Enclosures convert standard screws, bolts and nuts into ultra secure fastenings. Used in applications as diverse as securing winch equipment to Land Rover vehicles, and prison security applications, these clever products offer the ultimate protection. Manufactured from case hardened steel with a BZP (Bright Zinc Plated) finish, these clever NoGo enclosures are available in two types. They are designed to prevent unauthorised access to the head of a bolt or screw, or to a nut. In simple terms, the NoGo consists of a two-part cup and plug set that consists of a hardened steel Cup, with a hammer in Plug. 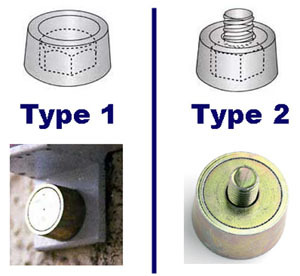 The "Type 2" NoGo is designed to prevent access to nuts where there is a protruding thread, which is why the hammer in plug part of the Type 2 NoGo features a hole through which the thread can protrude. 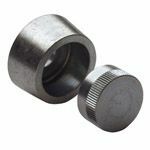 No-Go Enclosures are Home Office Approved and offer the ultimate level of protection for screw or bolt heads, or nuts. The hardened steel cups and plugs are designed to provide robust resistance to most forms of attack, including drills and saws. They are ideal for high security applications and are used in applications as diverse as vehicle assembly and the construction of secure enclosures (including HMP prison applications). NoGo installation is dead easy and no Special Tooling is required. 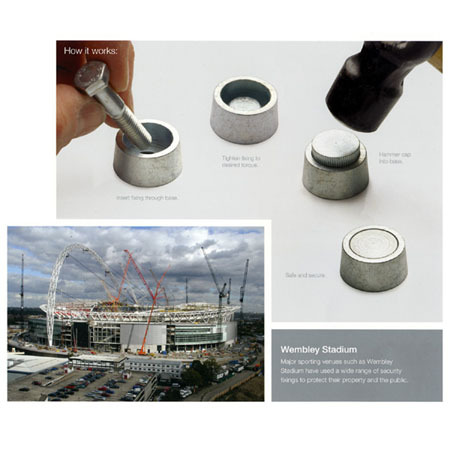 ...while the inset image shows Wembley Stadium, just one of the prestige venues where NoGo is used.